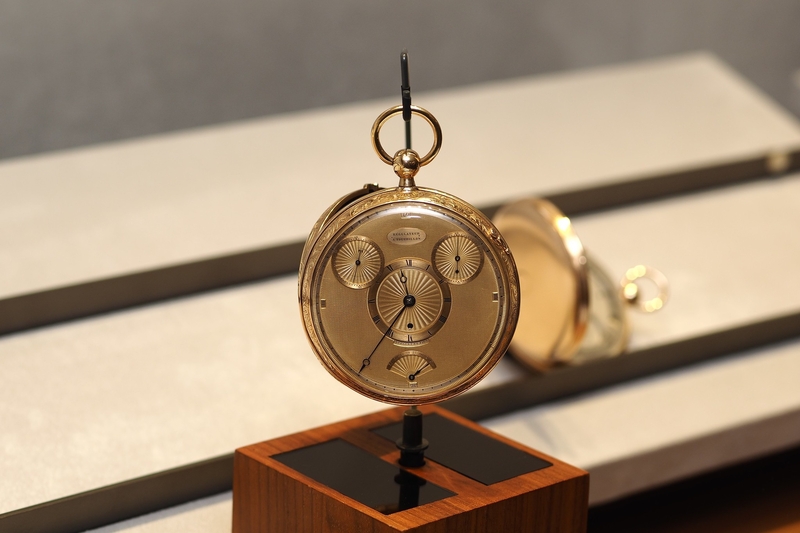 At Baselworld 2010, Breguet introduced the, which runs at a velocious rate of 10 hertz. The timepiece above is identical to the production version, but this particular sample did not have a working movement inside. 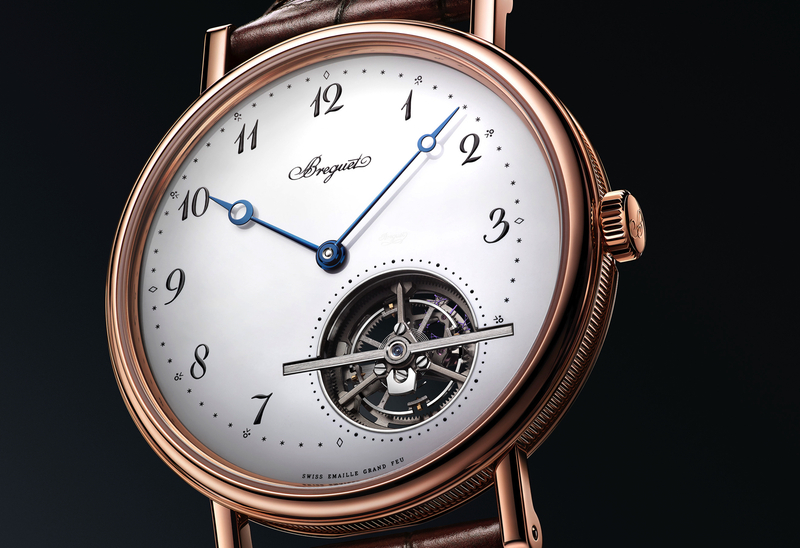 The Breguet, silicon escapement based movement, at 10 hertz which is 72,000 vibrations per hour – is fast. In fact, the Breguet Type XXII Flyback Chronograph GMT will have the fastest oscillating production wristwatch movement on the market. Notably, one benefit is the ability to record with 1/20th of second chronograph accuracy, and another is higher accuracy. Furthermore, the dial includes a second time-zone indicator along with an aperture for a date calendar. A two-position crown resets the second time-zone indicator by moving the hour hand at centre without affecting the minute hand. With the crown in that position, the date calendar obeys the time of the main time-zone displayed at centre. A 24-hour night-and-day indicator at 3 o’clock tells the wearer whether it is daytime or nighttime in the area covered by the second time-zone. At nine o’clock, a subdial showing the running seconds making full rotations in 30 seconds completes this truly exceptional timepiece. round, in steel, with fluted caseband. Diameter 44 mm. Round-ended horns. Two-way rotating bezel with 60-minute scale. Screw-locked crown. Water-resistant to 10 bar (100 m). oxidized black signed BREGUET. Luminous hands and hour-markers. Chapter ring with Arabic numerals. Red chronograph’s seconds hand on a 30-second basis at the centre. Half-minute totalizer at the centre. 24 hour indicator at 3 o’clock. Second time zone indicator at 6 o’clock with luminous Arabic numerals. Small second on a 30-second basis at 9 o’clock. 30 / 60 seconds indicator in an aperture at 12 o’clock. Date in an aperture at 6 o’clock. 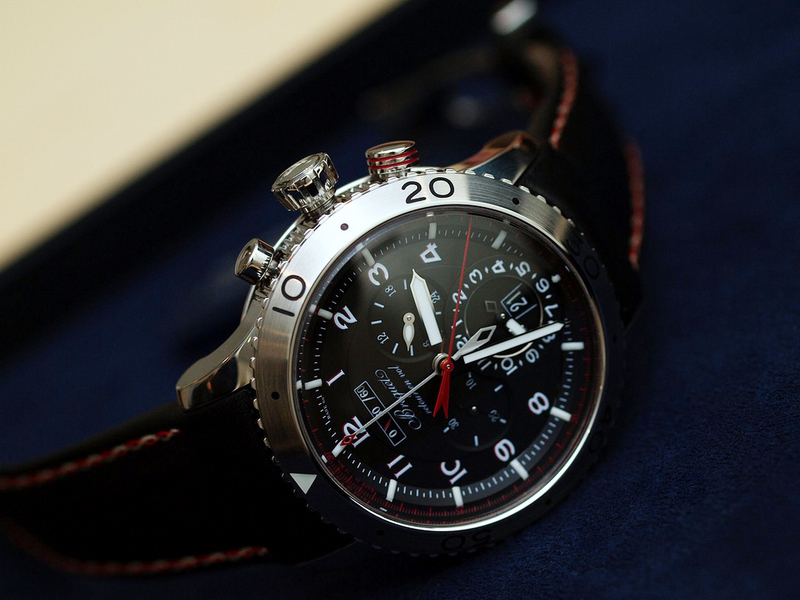 self-winding chronograph with flyback function and second time-zone. Numbered and signed BREGUET. Cal. 589F. 13¼ lines, 28 jewels. 45-hour power-reserve. High-frequency silicon escapement. BREGUET balance-wheel with regulating screws, silicon balance-spring. 10 Hz frequency. Adjusted in 5 positions.